An atmospheric, imaginative cyberpunk adventure with a human heart beating beneath its metal exoskeleton. What is it? A cyberpunk adventure about making people happy. Camdyn Lashawn is having a crisis. No matter how hard she tries, she can’t seem to grow her follower count on social media. And that’s why she’s currently hanging in front of you, naked, waiting to be fitted with an implant. You are Akara, an android created by the Supercontinent megacorporation—a new model capable of empathy—and your job is making Camdyn happy. The Red Strings Club is a cyberpunk adventure game with multiple playable characters, and a heavy focus on dialogue and character interaction over puzzles and exploration: whether it’s bartender Donovan teasing information out of his patrons, hacker Brandeis tricking people on the phone with a voice-changer, or Akara manipulating emotions by crafting cybernetic implants. She sculpts these implants from chunks of biomatter with, curiously, a kind of futuristic pottery wheel. Accessing a computer I can see that there are several implant blueprints to choose from—one of which will give Camdyn a newfound talent for amassing followers on whatever this bleak cyberpunk future’s equivalent of Twitter is. But will that make her truly happy? But I’m sure Camdyn will find something else to obsess over, and she’ll be back here on my operating table with another hang-up that needs fixing. The problems these people have are complex, with no neat solutions, and that gives you some interesting moral quandaries to wrestle with. And things get even more complicated when an unexpected visitor crashes into Akara’s workspace and makes her, for the first time, question the work she’s doing. Donovan, proprietor of the Red Strings Club, makes people happy, too. But he does it the old-fashioned way: with booze. And you’ll spend the majority of the game as him, behind the bar. When a patron sits down you can see their emotions, and mix a drink that will appeal to them—whether it’s to make them feel better or encourage them to talk about something difficult. Mixing cocktails is fiddly too, but again, is pleasantly tactile—especially the clink of an ice cube as you drop it into a glass. As you mix different types of booze together you see a circle drifting towards the emotion you’re targeting. And when the circle is lined up you can serve the drink. Lifting and pouring from the bottles takes some getting used to, but it’s a fun gimmick, and the sound of the liquid sloshing, and the way it pours out of the bottle, is oddly satisfying. Supercontinent, of course, isn’t all it seems. Early on it’s revealed that it wants to strip people of their emotions, believing they’re a burden to humanity. Is there a place for flawed creatures like us in an increasingly advanced, post-human world? The story tackles questions like this with confidence, giving it some philosophical weight and making sure you do some thinking as you play. This is not, like a lot of cyberpunk fiction, totally nihilistic. Its world is bleak and corrupt, certainly, but the narrative focuses more on the people trying to make it better. The dialogue is a bit overstuffed with unconvincing futuristic slang and jargon, but this is a well-realised world with interesting, nuanced characters and a few clever twists and turns that will catch you off guard. And it helps that the whole thing looks and sounds beautiful too, with a gorgeously moody neo-noir soundtrack, detailed, expressive pixel art, and an atmospheric setting to drink in. 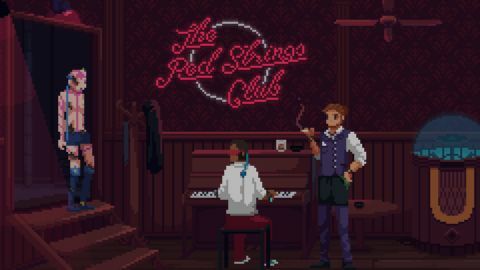 While it occasionally slips into cyberpunk cliche, and can be a little too earnest for its own good sometimes, The Red Strings Club is a distinctive take on a well-worn genre.